Dawn Brakey, Bid Assistance Coordinator at Pioneer Tech, has earned her certification as a Certified Procurement Professional. With Brakey are, left, Tiffany Scroggs, Association of Procurement Technical Assistance Centers President and Dave Pease, APTAC Professional Development Review Board Chair. Dawn Brakey, Bid Assistance Coordinator at Pioneer Technology Center, has earned her certification as a Certified Procurement Professional. 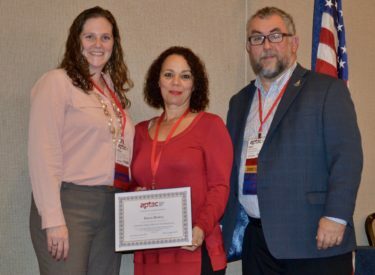 The certification was presented during a November conference in Washington, D.C.
Brakey’s new certification sets the standard for achievement in the field of procurement assistance. Developed specifically for government contracting support specialists, the qualification is a content-based credential which signifies specific and extensive knowledge to her skillset. As procurement assistance is a unique and rigorous profession, Brakey was recognized for achieving mastery level. To maintain this certification, she will continue training and education units each year. Brakey joins the ranks of the Association of Procurement Technical Assistance Centers’ subject matter experts, embodying a commitment to professional excellence in the field of government procurement assistance. “Brakey does an outstanding job with the Bid Assistance Program at Pioneer Tech. She has been instrumental in area businesses earning millions of dollars and placing those dollars back into our district. She deserves this recognition as she is a valuable member of our Business and Industry Services team,” said Molly Kyler, Executive Director of Business and Industry Services. For more information about the Bid Assistance Program at Pioneer Tech call (580) 718-4222 or visit pioneertech.edu/business.